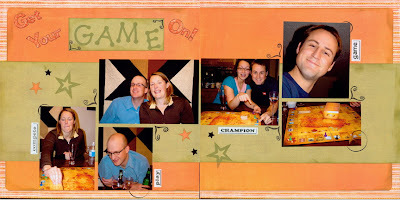 Scrapbook Savvy: Get your game on! Just seems to be a fun time of year, doesn't it? St. Patricks Day is kind of a lighthearted, skippy leprechauns in green tights kind of holiday, spring is in the air, and with Easter around the corner, there are all kinds of decorated eggs and candy...mmmmmm, Mini Eggs... How fun! As I'm in the mood for games, and my mojo needs a little boost, I've been playing along with some of the games at Just Cre8, a great little Canadian kit club who will be sponsoring the retreat. It's their birthday celebration all week and they have some awesome challenges, prizes, and classes going on over there. If you have time to play, head on over and see what Sue has in store for you. This is a quick layout I did for their sketch challenge. I may go back and add to it... I think it needs something more, but it's fun and whimsical which I like. Notice Brad and I pointing out our winning (at the time) board game piece? We never seem to do all that well at Canadian Trivia... a Mountie and a Parks employee, and we still can't win. Sad really. That's all right, we'll just beat them all at Scotland Yard or Clue! Ha! I just thought it was a cute picture for my 'book of me' scrapbook. 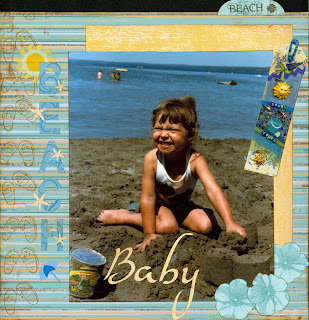 I want to get my mom to write some journaling for me, though, because I don't even know what beach this was at or how old I was... Luckily, I think she can help me fill in the blanks. Hope you all have big plans for Easter. We're heading to my parents farm for a little R and R and some visiting. Can't wait! The best part is that it's calving season, and they've all ready had a few so hopefully, when I come back I'll have some pics of the newbies frolicking around in the field to show you all.